This is one our favourite chicken dishes and the bonus is that it's light, healthy and full of flavour. But be warned, if you don't like ginger, DO NOT make this recipe! 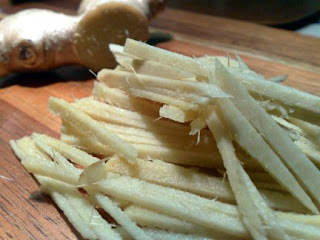 Or at least cut down the amount of fresh ginger. The ginger beer sounds strange but it creates beautifully sticky, fragrant rice that is tasty enough to eat on its own. We always make double the recipe so there is enough for lunch the next day. Toast the sesame seeds in a dry frying pan for 2-3 minutes.Combine sesame seeds, rice wine, honey, soy sauce, oyster sauce and sesame oil together in a large bowl to create the marinade. Cut the chicken into large strips and place in the marinade for 1 hour or overnight. For the rice, place the fresh ginger and sesame oil in a large saucepan over a low heat. Cook, stirring occasionally for 5 minutes and then add the rice. Stir for 2 minutes. Stir in the ginger beer and the pickled ginger. Bring to the boil and then reduce the heat and cover. Cook for 10-15 minutes until the liquid is absorbed. (We always make ours in a rice cooker and it works perfectly. Just remember to follow the recommendations given in the manual - usually 1:1 rice to liquid for white rice). While the rice is cooking, thread the chicken onto skewers and then BBQ or grill for 10-15 minutes, brushing with the marinade as they cook. (We don't normally skewer the chicken, just cook it in a large fry pan in batches). 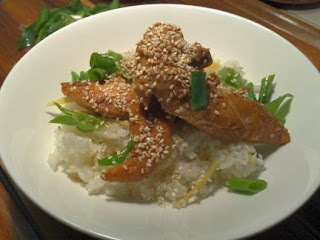 To serve, spoon rice into serving bowls and top with chicken pieces. 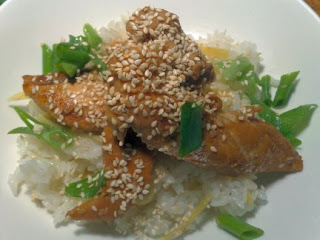 Sprinkle over sliced spring onions and tasted sesame seeds. Serve with greens. Yum!